Full credit is given in the read me of the zip file. Suffice to say I have used BitIO built by David Whale and a Python to Scratch script created by Laurence Molloy. 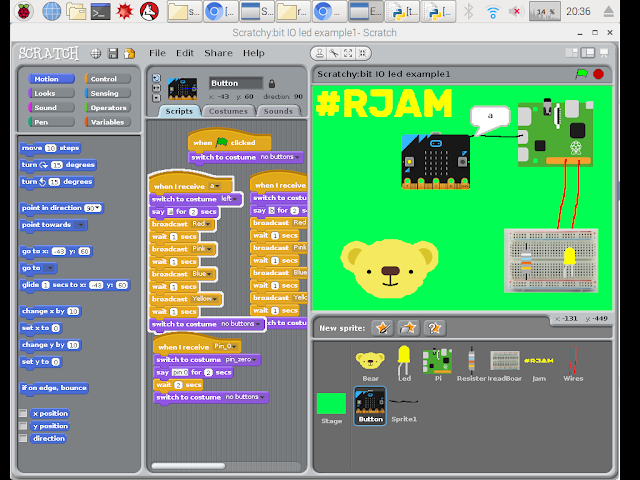 It essentially allows you to use the Micro:bit to interact and control Scratch. I have created a simple demo to get you started. Step 2: Unzip the folder by extracting it. Step 5: Click on the green flag to run the project. Step 6: Open Python 3 from the programming menu. Step 7: From the Scratchy:bit IO-master/src file path open the test_example_MB1.py script. Step 8: Press f5 to run the script. Step 1. So unplug the Micro:bit and press enter. Step 10 Finally if you click on the 'a' button you see some events take place. You can also press 'b' and use pins 0,1,2.